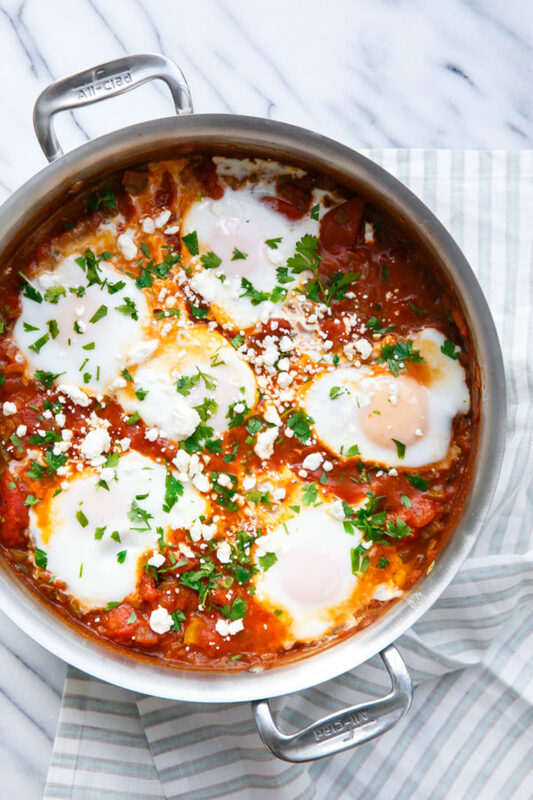 This recipe comes from our second book, Breakfast for Dinner. Sometimes I forget about the recipes in that book and how much we love them; we need to be better about revisiting them more often. Taylor especially loves this dish, and that’s no surprise, seeing as how it’s satisfying and hearty and chock full of peppers and onion and everything else he loves. 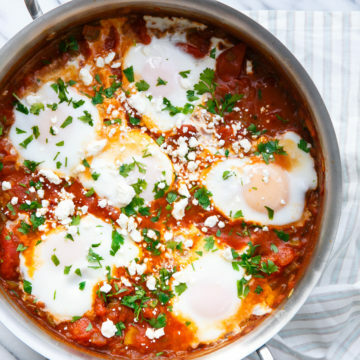 Shakshouka (or shakshuka) loosely translates to “all mixed up” in Arabic, and hints at the potent spice and exotic flavors. 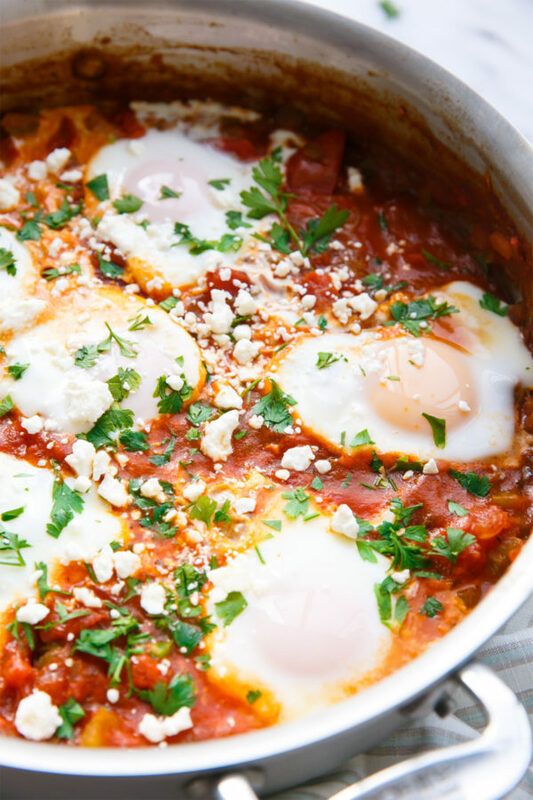 This one-pot-wonder of a dish also goes by the name “eggs in purgatory”. I don’t know who came up with such an obvious misnomer, but I seriously question their judgement: anyone with tastebuds will know that this richly spiced tomato sauce is hardly purgatory. In fact I’d argue that it’s nothing short of heavenly. 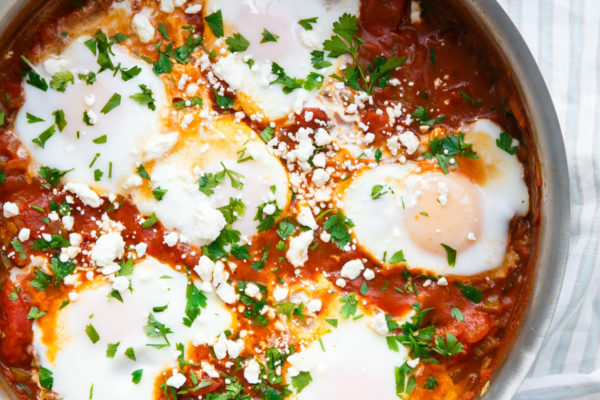 Which is why I think shakshouka is a far more apt name, in my opinion. Perhaps it’s the same ‘they’ that decided eggs were breakfast, and tomato sauce was dinner, defining a set of arbitrary boundaries that still define our meals to this day. I cry foul. Perhaps this anonymous ‘they’ needs to step out of their comfort zone a bit, get out and see the world. A bit of worldly perspective will do wonders for the soul; they may even change their tune entirely. Meanwhile, ‘we’ will cook up our eggs in a pot of simmering spicy tomato sauce and eat it for dinner. Or for breakfast. Or any time in between. Because ‘we’ won’t be defined by such pettiness as breakfast and dinner stereotypes. We like to serve this with warm pita bread, perfect for sopping up oozing egg yolk and leftover sauce. Crusty bread would be perfectly suitable as well. And while our version takes on a distinct middle-Eastern flavor, you could just as easily shift it towards the Italian coastline (think a more traditional and less spicy marinara sauce, maybe with parmesan cheese instead of feta). That you’d call Uova al Pomodoro. 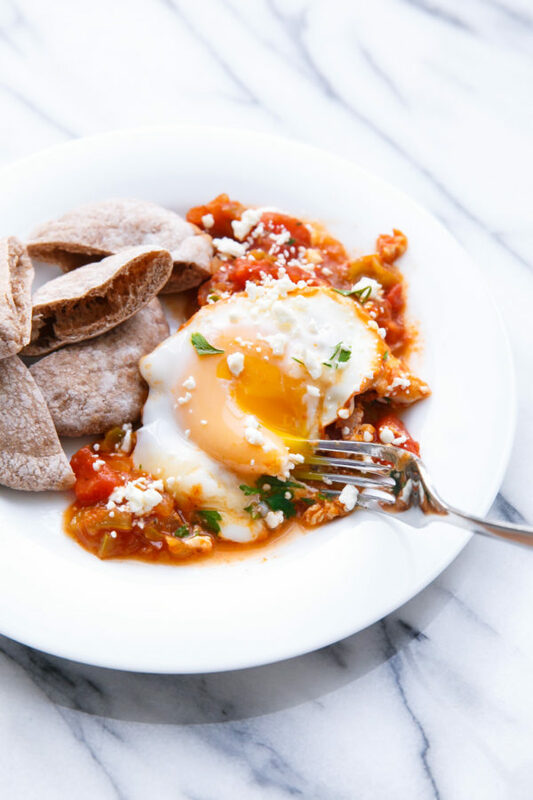 Indeed, this dish not only blurs the traditional mealtime boundaries between breakfast and dinner and beyond, it also spans cultures. Dare I say a recipe like this could bring about world peace? It sure seems that way. In a large, deep skillet, heat oil over medium-high heat. Add onion and peppers and cook until softened and beginning to brown, about 7 minutes. Add tomatoes, vegetable broth, cumin, paprika, oregano, and salt and pepper; simmer for 20 to 22 minutes or until thickened. Crack eggs evenly on top of sauce; cover and cook for 6 to 8 minutes or until whites are set and yolks are thick but runny (if you like firmer yolks, cook for 1 to 2 minutes more). Sprinkle with parsley and feta cheese and serve with warm pita bread. From our book, Breakfast for Dinner.